Sleep on NASCAR at your own peril, but NASCAR is one of the most popular sports in the United States, especially in the southern part of the country. 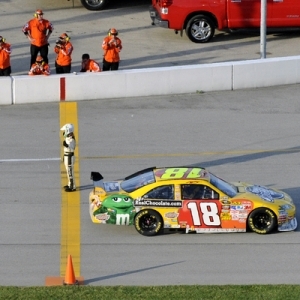 NASCAR is the fastest sport on the planet, with cars reaching upwards of 200 MPH on an oval racecourse. Because NASCAR is big in the warmer-climate states, NASCAR essentially runs all year long, culminating in the year-end Monster Energy Cup that declares the season's champion. If you are new to NASCAR and are thinking to yourself how turning left for three hours could possibly be exciting, you've clearly never been to a race or had a wager on one. The energy at NASCAR events are second to none, and watching your favorite driver pass a rival on the final few laps to take the lead is a feeling like no other. With that said, let's take a look at some ways you can get in on the NASCAR wagering action. A wise man once said, "if you ain't first, you last". Ricky Bobby might have been on to something, and with that, the simplest way to bet on NASCAR is by betting on the driver that you believe is going to win the race. Now, with a field of more than 30 cars, this is a difficult task, but if you do connect, the payouts are often quite nice. Daytona 500: Joey Logano +2000, Kevin Harvick +1400, Jimmie Johnson +3000, Kyle Busch +1200, and the list goes on and on. In this example, for every $100 wagered on Harvick, you would receive $1400. For every $100 wagered on Johnson, you would win $3000. And so on and so forth. For most big races, sportsbooks will also offer a "Field" option, which gives you the option to bet on a group of drivers that don't have individual odds - typically long shots. Driver Matchups are similar to golf in a way that they pit one contestant versus another, regardless of what the rest of the field does. It doesn't matter if your driver finishes first or 16th, as long as the driver you bet on finishes ahead of the other driver in the matchup, you will win your bet. If you like Logano to finish ahead of Johnson in the Daytona 500, you would need to risk $170 in order to turn a profit of $100. Logan will need to finish ahead of Johnson in the official finishing order for your bet to be declared a winner. If you like Johnson to finish ahead of Logano, then you would win $125 for every $100 wagered. There are two NASCAR prop bets that I really like and that have been kind to me over the years. The first prop bet is the finishing position of an individual driver. Sportsbooks will set out lines like "Joey Logano finishing position "over" 5.5 or "under" 5.5 -115. This means that if you are really high on Logano and like his chances in the upcoming race, he will need to finish in first, second, third, fourth or fifth, for your "under 5.5" bet to be considered a winner. If he finishes sixth or worse, all "over 5.5" would cash. The other NASCAR prop bet I like is the "Winning Car # - Odd or Even ". This prop can be broken down and handicapped in a way that many other props can't. It's essentially guaranteeing you receive half the field (essentially) for just under even-money odds. Typically, odds will check in at -115 on each side, but in some races with smaller fields, one side will have lower odds due to the popularity of certain drivers. Each car has an assigned number, so it's best to check which drivers you are getting before placing a wager on "odd" or "even" cars. A futures bet is a wager placed in the time leading up to the start of the event on a team or player that you believe is going to win their respective competition. The biggest NASCAR races to bet on are the Daytona 500, the Winston 500, the Coca-Cola 600 and the Southern 500. Typically, you can find odds for these events well in advance of the event itself, and sometimes laying down a futures bet offers more value than waiting until race day. In order for you to successfully cash your ticket, you must correctly choose the driver that will finish first in each race, respectively. Preparing to wager on a NASCAR event features more than just handicapping how things look on race day. Sure, the popular drivers such as Kevin Harvick or Kyle Busch will always be at or near the top of the odds board, but it's the other drivers who have a great week of qualifying and practices who may stand out of the pack at longer odds. NASCAR begins the week with qualifying runs for drivers to determine which position they will be starting from on race day. Qualifying in a good position will mean starting from the front of the pack and getting to choose your pit stall for the race week. Why is this important? Well certain race courses are designed in a way that makes it easier or harder to pass cars. On a track that makes it harder, starting at the front of the pack is very beneficial because the rest of the field will have to push their car harder and take more chances. On an easier track, position is not as important since passing is much more possible. So, for newbies to the NASCAR world, do your research on the track and then get ready to study the practice runs. Practice runs are a great opportunity for handicappers to see what cars look good and what cars are struggling heading into the race itself. You should make note of the weather conditions these runs take place in and see if the weather figures to be the same on race day. And lastly, track history is a big factor in NASCAR. Certain drivers have a knack for excelling at certain tracks and struggling at others. It's yet to be determined on why that's the case, but a quick look into a driver's race log will show you how they've fared in the past at a specific course. Don't go blindly betting the popular names because they are the only names you know.